please refer to our Resources section. Hyperbaric Oxygen Therapy (HBOT) is a clinical treatment where the patient breathes 100% oxygen intermittently while enclosed in a hyperbaric oxygen chamber at a pressure greater than one atmosphere. Hyperbaric oxygen therapy, within a Sechrist hyperbaric chamber, has assumed an ever-expanding role in modern medical practice, offering numerous advantages to physicians, surgeons and patients. Its clinical use in a growing number of indications demonstrates its effectiveness in primary and adjunctive care. A hyperbaric chamber, combined with the team approach of a hyperbaric specialist and the referring physician, provides very effective treatment of various conditions. Hyperbaric oxygen therapy involves the systemic delivery of oxygen within the hyperbaric chamber at values two to three times greater than atmospheric pressure. Patients are placed in the hyperbaric chamber and breathe 100 percent oxygen while exposed to elevated ambient pressures. As an application of an established technology, hyperbaric oxygen therapy is helping to resolve a growing number of difficult, expensive or otherwise hopeless medical problems. Elimination of intravascular and tissue gas bubbles, which trigger coagulopathy and other mechanisms in the complex diving disorder, decompression sickness. Restoration of CNS perfusion by compression of intravascular gas emboli in pulmonary over-pressure diving accidents or iatrogenic intravascular gas embolism. Increased partial pressure of oxygen (tension) which increases the amount of oxygen dissolved in plasma. This can increase oxygen levels to approximately 450 mmHg at the tissue level. CVasoconstriction and reduction of edema in the area of trauma. Oxygen tension may be 10 to 20 times that achieved by normobaric oxygen breathing. Rapid dissociation of carbon monoxide molecules from hemoglobin and cytochrome A3 oxidase (23 minutes at 3 ATA) as well as greatly improved delivery of dissolved oxygen in the plasma. Stimulation of growth and occurrence of fibroblasts, osteoclasts and granulocytes, resulting in wound healing. The resulting angiogenesis enhances healing skin grafts, select problem wounds and compromised flaps. Because oxygen inspired under increased atmospheric pressure is a potent drug, hyperbaric oxygen must be administered carefully to avoid toxic effects. A patient’s clinical response and other factors often dictate the number of treatments required. 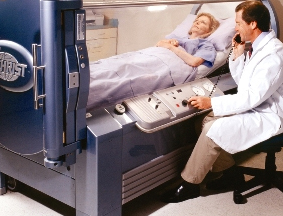 Emergency cases, such as carbon monoxide poisoning or cerebral arterial gas embolism, may only require one or two treatments in a hyperbaric chamber. Non-healing problem wounds may call for as many as 20 to 30 treatments. Radiation tissue injury may require 60 or more hyperbaric oxygen treatments for optimal benefit. Except for decompression sickness and cerebral arterial gas embolism, treatments in a hyperbaric chamber last about two hours. Treatments are administered once or twice a day. In some cases, treatments are administered every eight hours. Most acute conditions are treated in less than 10 days. Chronic conditions may require 30 or more treatments. In some cases, patients can watch TV/movies within the hyperbaric chamber or listen to the radio during therapy. Sechrist has been integral to the research and development of hyperbaric medicine for more than 35 years. 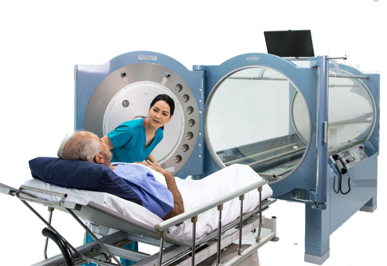 In that time, Sechrist hyperbaric chambers have been used to assist physicians in the pursuit of lifesaving applications of hyperbarics. Hyperbaric oxygen therapy offers you and your patients a modality for treating a broad range of conditions in which oxygen breathed under increased atmospheric pressure can reverse wound healing failure and speed recovery. Enhanced collagen production, fibroblast proliferation, and neovascularization to provide support for the growth of granulation tissue.